Crocheted entirely from Koigu KPPPM, this sea-inspired beauty worked up in a matter of hours, mostly due to the fact that I used one of my existing patterns as the basis for this creature. Remember Leah O'Lantern's wig? Well, the long panels were perfect for bell portion of the jellfish anatomy. The jellyfish's oral arms are supported by a round, stuffed structure sewn in the upper interior of the bell that acts as a support system so that the weight of the arms won't drag the sides of the bell down and distort its shape. I am definitely going to make a bunch of these in different colorways and textures (I'm thinking mohair for future jellyfish buddies). Methinks that they'll look great hanging from my ceiling. That is.... AMAZING!! I truly love it! I kind of like the idea of several of them hanging from a ceiling. I really like it. I was surprised, however that he is "blind"...you know sans giant eyeball. I think this is the best use of variegated pastel I've seen. I'm serious. Hmm, my first thought was that it would make one heck of a chandelier! there is something strangely beautiful about a jellyfish anyway but you're is by far the most beautiful I have seen. Oh! Oh! OH! I love it! I do, I do! Are squid next? Or sea bugs (aka lobsters)? You're so much fun to watch create! I LOVE that! I think it's my favorite of your stuff so far - can't wait to see any variations you might come up with! Fun! I think your status as Evil Crochet Genius will remain unchallenged forever. I love it! I want to make one! It is beautiful. You are sooooo weird. But in a good way. LOL. You should send one to Hilde from Trading Spaces and see if she'll design a room around one. Will you be opening the first-ever Crocheted Aquarium someday? My challenge to you is to make a transparent jellyfish! (Evil laugh) Seriously, this is so great! I wouldn't have realized you borrowed the wig pattern. And yes, I have to join in, the lack of pronounced eyeball is noted. I say put the eyeball "floating" in the arms! If the Monterey Bay Aquarium could see you now! You know, they'd probably sell their souls to stock these in their gift shop. Evil genius you!! I love it!! As soon as I saw your latest creation I immediately thought that it would look great hanging from the ceiling in my kiddo's room. Great job! Lovely! I've always thought jellyfish were some of the nicest designed creatures on earth. I think this is my favorite of all your creations! I would love to have one of these hanging in my house (hint hint! Pattern?). How gorgeous! OMG! Your Ladyship!!! This is an outstanding creation! You are waaaaaay too clever. Will you be at the WeHo SnB tonight? Will you bring Ms. Jellyfish with you? That is FANTASTIC! By far my absolute favorite! Just gorgeous! It reminds me of a trip to the Monterey Bay Aquarium and their beautiful and mesmerizing jellyfish tanks. I agree with finnyknits, MBA would probably love to sell these!! Ooh, I love that. I think they'd be very saleable. Wow, I think mohair would be very very interesting and beautiful. Jelly fish are very interesting creatures, I study them in Science and they are fascinating. So is your work, great job Regina. Gorgeous! If you get enough of them together, it could look like a Chihuly exhibit! I'll second the crocheted aquarium idea, too. WOW! Pretty cool Regina, pretty cool. It is beautiful! And the mohair might make it look even more realistic. It would almost be transparent just like the real thing. Do they make opalescent fishing line? Just a thought. Oh if you ever could make one, my favorite sea creature is the sea horse. I do want to buy some of your creatures some day, and that would be one I would jump for immediately! You have ben challenged to a Meme on my blog. Incredible! You do such beautiful and creative work! I would love to see an exhibit of all your work. All you creatures under one roof on display. It would be so amazing. I love this creation. Was thinking the same - awesome ceiling decorations!! The jellyfish is fabulous!!! You are so creative. Hope someday we can buy a copy of this pattern from your site! I would really like to make one for myself! This is simply a captivating creature! regina, awesome as always. 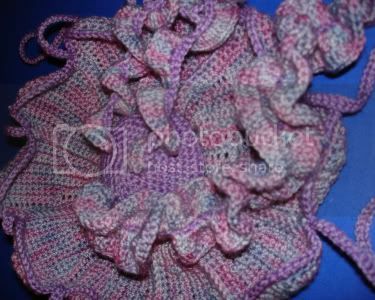 i have made a octopus before, but never a jelly fish, i bow to you LOL LOL great job sweetie. i looooooooove it. you know what would be even MORE amazing, if that is possible, is if it was irridescent. or semi transparent. how much yardage did you need for this...i am thinking of silk with an irridescent sparkle added in...n'est ce pas? I LOVE this Jellyfish. 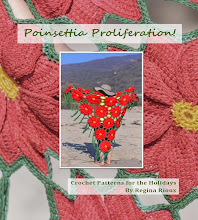 Hope you can share a pattern for it. My Grandson lives in Monterey and goes to the aquarium a lot. He loves jellyfish. Thanks for sharing your innovative work and your sense of humor. I no longer drink anything when I visit your site!! 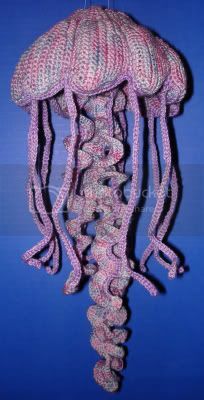 How much is that jellyfish in the web window, the one with the crocheted tentacles? that is great!!! it looks so real! my foster sister is going to have a baby soon and she is doing the nursery in an ocean theme and that would look great in the nursery! You should start selling those. WOW!!!!!!!!! i LOVE jellyfish and yours is soooo cute!!!!!! 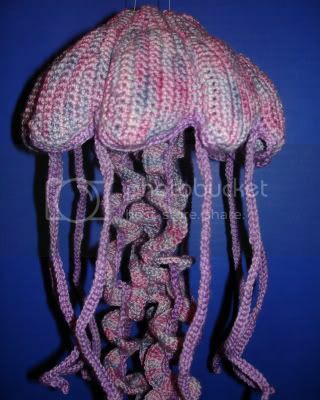 i think this is one of the coolest crochet animal/sea animal/jellyfish i have ever seen!!!!!!!!!!!!!!!!!!!! oh, and i cant wait to see a crochet aquarium ; )!! Great pattern! My son needs a model of a jellyfish for a school project and this would be perfect! I couldn't find a way to purchase the pattern though. If you could point me there I would greatly appreciate it!! I need some tips! I saw crocheted jellyfish on etsy and found your site to make my own. But I've never crocheted before. So far I've made 2 jellyfish but they don't come out looking as pretty as yours. I need some help/tips on how to crochet the panels... especially on the curved parts!